“Hear me clearly. Power isn’t having magic, weapons or gold. It is not in the having, it is in the being able to twist all of these things to your advantage and use. What does it matter if you have enemies if your enemies can be bribed with one another’s money to kill each other? We are free to walk the earth to take anything we need and we protect our families and kin by having powerful and useful contacts. We are proud of our position in this world. We are the providers of battle and they couldn’t wage their never-ending wars if we did not get them what they needed, from horses, to swords, to supplies. We provide but we are not interested in getting involved. War and carnage are not for us, we have families, we love life. We have culture and history so why do the other peoples of the world consider us to be horrible and evil parasites, to be paid off and ignored. That is a question, for which we have no answer. Nightlings are a sub-tribe of Goblins, known as mischievous meddlers, whispering troublemakers, and absolute mercenaries. They often find themselves in battles but never battles of their own making (they don’t have the time…). Cross their yellowy-green hands with a few silver coins and the job is as good as done. Nightlings are very cunning, though and if they find themselves in real trouble, they will call upon their curel and vile allies – Shadow Elves (or worse…) – to lend a hand… or cut off an ear or two. The Nightlings actually benefit from the great catastrophe that devastated the world of Ascendallion. Being forced to inhabit the caves of the undermountain after several defeats against the Dwarves, the Nightlings now think it’s their time to strike back. Their Bonerollers actually interpret the meteor as a sign of the gods and spur their bethren on to battle. Since the Fall, the Goblins levy massive armies and streams of green skinned lunatics pour from the Undermountain. Nighlings travel in marauding bands of between 50 and 100 members, hunting and raiding by night and sleeping in caves or hollows by day. They’ll often attack merchant camp sites and steal what they can – not necessarily killing their victims as they would hate to eliminate the chance of robbing them again! More ferocious than their Goblin cousins, they have pasty yellow or grey skin. They wear hooded robes and often carry short stabbing spears, blow guns, and other close range weaponry. This sub-tribe is despised by most Goblins as they will work for anyone – wether they agree with the reasons for the conflict or not. Despised or not, the Goblins will still use them if they have a particularly nasty job to take care of! The advancement of technology and war skills has led the goblins down several paths of experimentation, including the recent development and introduction of the shield wall. This is seen to be a very succesfull tactic but is also a great test of patience and organisation for the leaders. 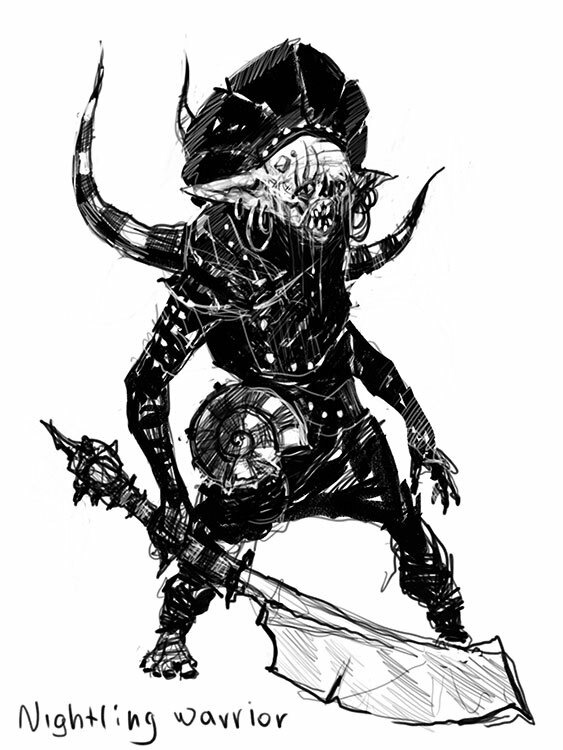 The average goblin has an eager, easily excitable persona wich doesn’t sit well with the concepts of the shield wall – and the leaders must control them at all times. Partly armored and skilled with various weapons and in particular the bow, the mounted infantry are very fast and manoeuverable and ride giant wolves and on occasion other beasts. These skirmish riders receive special training wich allows them to ride and use their bows at the same time. They enter battle in a unique manner, ignoring standard lines of attack and instead making fast attacks and even faster exits to pick of the slower enemy infantry. Riding about the enemy flanks and rear, they avoid their archer regiments and have been known to complete an encounter without the loss of a single rider. Long standing troops that have gained fame from heroic acts in the service of the warlord are dubbed heroes with all the privileges this title endows. They are the acknowledged best all-around fighters of their particular regiment, and must undertake a testing ritual before they receive their public promotion to this prestigious rank. The guard is the front rank of the goblin defense, entrusted with the protection of the homestead and other special areas. Proficient with both sword and dagger, the missile weapon of choice for guard members is the hand held sling. It only takes a small rock or crystal in the hand of a master to make it deadly. Trained in all manners of hand-to-hand combat, they are often called upon to join the ranks of travelling war patrols and may also act as personal bodyguard for the explorers, when the goblin warlord sends out a new party. 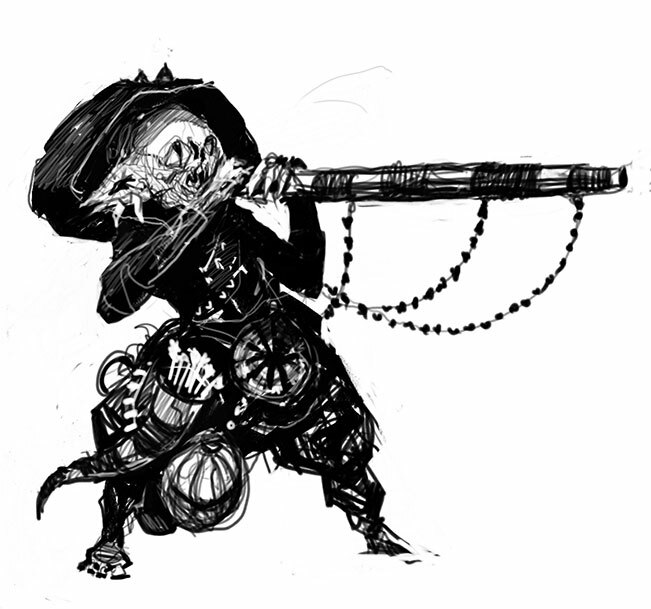 A long established part of the goblin life are the bone rollers, Visionaries and mystics who throw animal bones on velvet cloths and then divine the results. These “fortune-tellers” are often called upon before battles and other important events to foretell the outcome. There is a call now to abandon the old ways but there will always be those goblins who prefer that which worked for their ancestors. Goblin Magic Users, known as Shamans, are well respected in their society although they are reclusive and antagonistic towards almost everyone. Military leaders who are veering away from the use of Bonerollers in their campaigns have no qualms about using the services of a good Shaman. Previous post: What is a tabletop RPG?